Samsung Galaxy A9 (2018) smartphone was launched on Thursday launch event. Samsung Galaxy A9 (2018) is the World's First phone with 4 rear camera setup. Samsung Galaxy A9 (2018) has an Infiniti display, its aspect ratio is 18.5:9, 8GB of RAM, 3D curve Glass. Let's Talk about the Samsung Galaxy A9 (2018) Price, Specifications & Features. Samsung Galaxy A9 (2018) price has been set at 599 Euro (approx Rs. 51,300). 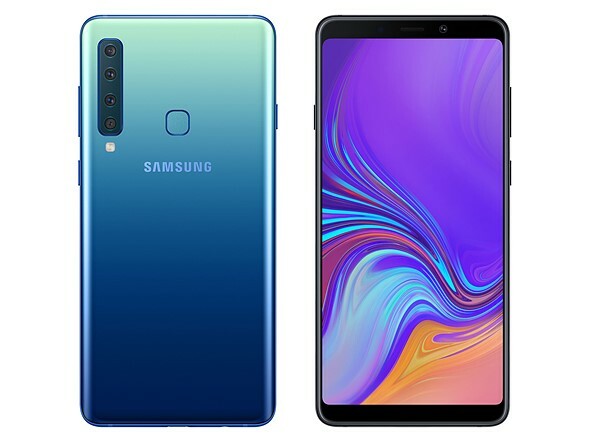 Samsung Galaxy A9 (2018) has three color options it will be Bubblegum Pink, Caviar Black, and Lemonade Blue. The Dual-SIM (Nano) Samsung Galaxy A9 (2018) sports a 6.3-inch (1080x2280) Full-HD + super AMOLED infinity display. it runs on Android 8.0 Oreo. it is powered by 2.2 GHz Qualcomm Snapdragon 660 processor. Samsung Galaxy A9 (2018) has 128 GB of inbuilt storage. If needed, the user can increase storage up to 512 GB Via MicroSD card. Samsung Galaxy A9 (2018) is the World's First phone with 4 rear camera setup. The phone has a 24MP + 10MP dual rear camera. Samsung Galaxy A9 (2018) has an 8-megapixel ultra-wide camera that comes with a 120-degree lens. it also comes with a 5-megapixel depth camera whose aperture is F / 2.2. Samsung Galaxy A9 (2018) has a 24-megapixel front-facing camera. connectivity options include 4G VoLTE, Wi-Fi 802.11 AC, Bluetooth 5.0, USB Type-C, NFC and 3.5mm headphone jack. Samsung Galaxy A9 (2018) has a 3800 mAh battery which supports fast charging.